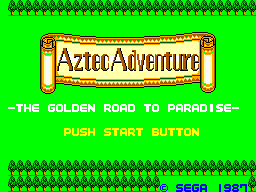 Aztec Adventure: The Golden Road to Paradise, known as Nazca '88 (ナスカ'88) in Japan, is an action RPG developed and published by Sega for the Sega Master System. The setting of the game was changed from Nazca, which is in Peru, to Aztec, which is in Mexico. This may have been because people are more familiar with the Aztec civilisation than the Nazca (oddly, the Brazilian release uses the American name instead of the Japanese one, since Brazil is near to Peru). The player assumes the role of El Niño, an adventurer in search of wealth and happiness in the Aztec/Nazca paradise. Niño is armed with a sword, and extra weapons and items can be picked up from dead enemies. Some enemies can be bribed with money to join Niño, increasing his firepower, until they are killed. The game bears a superficial resemblance to The Legend of Zelda, an RPG released for the NES a year before. Main article: Aztec Adventure: The Golden Road to Paradise/Magazine articles.